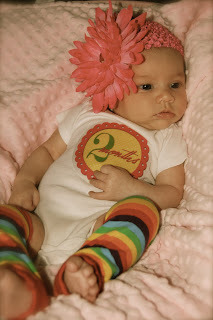 Bits of Splendor: I'm 2 months old today! I like to roll over. I don't like when mom and dad continuously put me on my back just to see me roll over. It makes me tired. They seem to enjoy it. I like my swing. I don't like when it stops. I like when my brother "pets" me on the head and my sister kisses my toes. I don't like when they fight over who gets to give me my paci...it usually ends up poking me in the eye instead of getting in my mouth. I like being held. I don't like being put down. I like my activity mat. I don't like it for more than 10 minutes but mom says she'll take that 10 minutes. I have to see what is going on all the time. I move my head back and forth and stretch to see something that is happening. I'm nosey. I love to be rocked to sleep. I like to put my face in mommy's neck while she hums. I like to eat. I don't like waiting. I like to be talked to and I love to smile. I like to listen to 'Jesus Culture' in the car. I don't like when the car stops. I love to be carried around in the sling on walks and errands. I like to sleep on my tummy and I take good naps in my crib. I like to sleep with my mom at night. I like her side of the bed, even though she moves me to my spot, I always find my way back to her side. I love to snuggle. I don't like to be put down. I like the ocean sound on my sound machine. I love my room. I must be seeing my angels because I smile and laugh at them every time I am in there. My changing table is one of my favorite spots to talk to them. I like watching my brother and sister dance to "Yo Gabba Gabba" but I don't particularly like to watch "Yo Gabba Gabba." I love when my dad holds me and makes me laugh. I love taking baths and dipping the back of my head in the water. I think I can swim. Mom says I can't. I'm 2 months old and mom keeps telling me to slow down, but I don't think I'll listen. I'm ready to get down and play with my brother and sister! Did I mention I don't like to be put down?